Your wishlist has been updated. Did you know you can share your birthday as well? Just enter it below..
Having a difficult time getting connected with leaders who have the ability (and proven track record) to teach, train, and mentor your business? Feeling like you're not getting all of the information that's out there? Consider this an answered prayer: When you become a member of the Champions Network, you are automatically connected with the top leaders in AdvoCare! You will be able to stay up-to-date with their important announcements as well as events they are hosting around the nation! Imagine a private, AdvoCare-only communication tool that allows team leaders to communicate and strategize together. Whether it's planning a mixer, organizing a team incentive, or casting vision for a major impending event, Groups help streamline your communication. 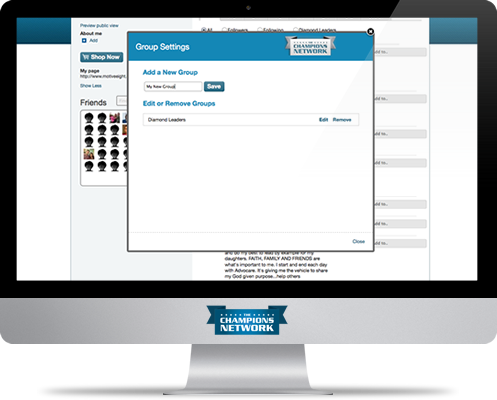 When you start a Champions Network group, you are able to share and post messages with designated friends. Groups create an environment for you to have focused conversations or team collaboration. In a world of confusing online marketing tactics and overwhelming online platforms, the Champion's Network streamlines how you can bring your business online in a clean and professional way. Build a uniquely targeted, professional profile with your story and bio, add a picture, and customize the page with promotional videos of your choosing. Your public profile also has an area for lead capture - a place for prospects to provide you with their contact information and send you a message. 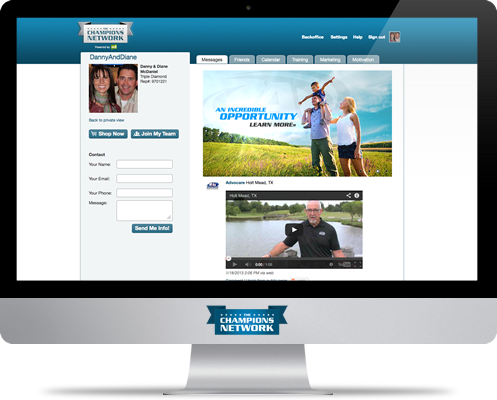 The Champion's Network integrates with your existing AdvoCare microsite directly, to make your retailing and recruiting processes much simpler! 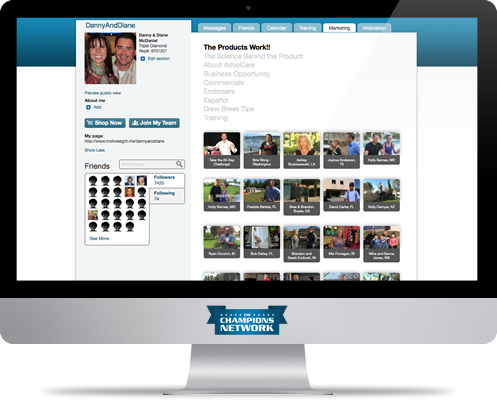 When your potential customers are ready to order product or join your team, your Champion Network profile will forward them directly to your microsite! You've heard it said before: The number one rule in AdvoCare - get you and your people to the impending events. 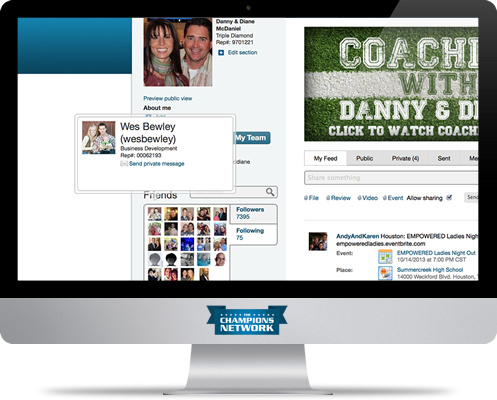 The Champion's Network now makes it easier than ever to make that happen! When you join, you're instantly granted unlimited access to a nationwide event calendar. 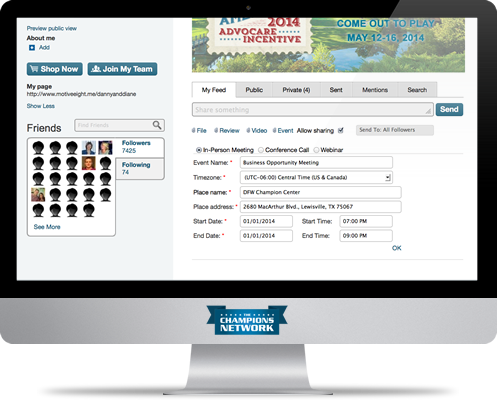 Post your in-person meetings, webinars, or conference calls on the Champions Network to draw in a larger audience. Or, take advantage of events posted by the company's top leaders and be sure to get your team in the room! What if you had instant access to a massive library of AdvoCare income and weight loss stories? Imagine a "resource hub" for the best content in the world of AdvoCare that can be instantly shared via Facebook, Twitter, Email, Google + and a myriad of other networks! Instead of having to scour YouTube or Facebook for success stories for your prospects, hundreds of targeted marketing videos are at your fingertips in one convenient place! Now, strategically telling your friends and family about AdvoCare got that much easier!